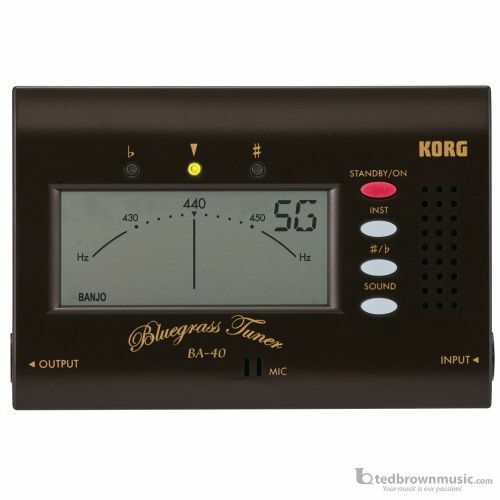 Korg's BA-40 Bluegrass tuner makes quick work of tuning your mandolin, fiddle, banjo and resonator guitar - plus guitar and bass. Input and output jacks allow the tuner to be placed in-line between the instrument and amplifier. Or, rely on the built-in microphone and built-in speaker for tuning acoustically. Bluegrass music and bluegrass instruments require their own special tunings. Settings for banjo, mandolin, fiddle, resonator guitar - plus traditional guitar and bass - are preset. The sharp/flat key transposes the pitch in half-steps, allowing you to tune your instrument while keeping the capo on. For the electric player, input and output jacks allow the tuner to be in-line between the instrument and amplifier. For the acoustic player, the BA-40 can generate audible tones to tune to; and can listen to your tuning thru the built-in mic. Highly accurate, sensitive to +/- 1 cent.